Matt Adams - Superheroes, Sci-Fi, and a Touch of the Fantastic: And they're back! 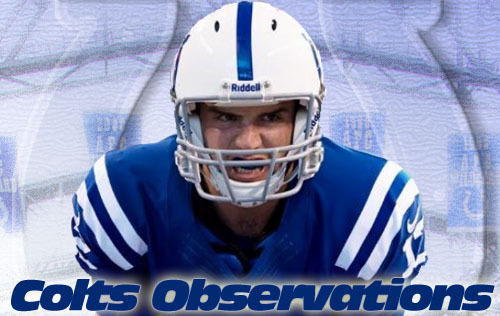 New season, new round of Colts Observations. 1. True tight ends? The Colts plan to capitalize on the talents of Coby Fleener and Dwayne Allen. The two tight end set is supposed to be a mainstay of the passing game, yet we haven't seen Allen and Fleener on the field together. Both ended up getting hurt. And Fleener...well...Fleener was Fleener in the preseason--flashes of brilliance punctuated by embarrassment and fragility. If these two can stay healthy, the Colts will indeed have a formidable, explosive tandem. If. 2. 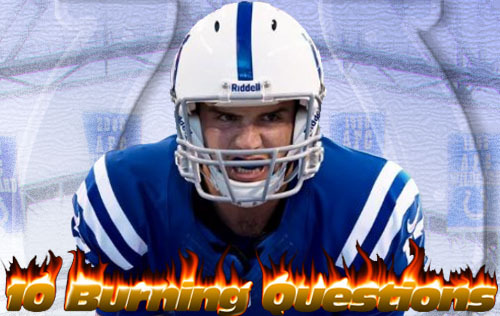 Andrew Luck: regression or progression? The answer here will certainly be the latter. Luck will throw fewer interceptions and get hit fewer times this season. The Colts will utilize a rhythm passing attack that will get the ball out fast, capitalizing on Luck's quick release and decision-making ability. The game will slow down for him in year two. 3. What about the running game? Time and time again, the Colts said they'd utilize a power running game. They seem serious about this--fullback Stanley Havili is on the roster. They signed punishing running back Ahmad Bradshaw, who provides a great one-two combo with Vick Ballard. Donald Brown remains with the team as the explosive back with home-run capability. It really all comes down to winning the battle at the line of scrimmage and being patient enough to eke out three or four yards until the defense wears down. 4. Will the rebuilt offensive line perform? The Colts invested in free agents Gosder Cherilus and Donald Thomas to bring more experience and stability to the offensive line. Even then, there are so many questions. Will the health of the line hold up (Anthony Castonzo is already dinged up)? Did the team do the right thing by retaining Samson Satele and shipping off A.Q. Shipley? Will the line have enough cohesion to get the push in the running game and protect the Franchise? It seemed like Luck did a lot of running in the preseason and we haven't seen Bradshaw run a play yet, so this one's up in the air. 5. Where will the pass rush come from? I know, I know. Robert Mathis. Of course. But #98 needs complementary players. The team seems to be slowly integrating first-round pick Bjoern Werner ("I bring in da good stuff, coach!") into the mix. He showed some flashes in the preseason, but the jury's out. The Colts gave a hefty contract to Erik Walden, a move that garnered its share of criticism in the unproven free agent. The fact that Indy traded for Cam Johnson tells me they're not 100% sold on the outside linebackers just yet. This could end up being a dynamic, deep unit if everything works out. 6. Will Darrius Heyward-Bey really catch on? Reports from training camp told a terrifying tale: DHB keeps dropping passes. It was disheartening because that was the knock on him in Oakland (although the Raiders didn't have a QB capable of getting him the ball...). However, DHB seemed to shake it off in the preseason, becoming a reliable target for Luck. He's got good size and great speed, and his presence could really set things up nicely for the offense. He'll have a little extra incentive this week against his former team. 7. Is the secondary really as solid as it looks? I'll tell you what, I'm excited about the Colts secondary--something I don't know I've ever said in the history of my Colts fandom. The safeties are terrific--Antoine Bethea is solid and LaRon Landry looks like a stud. Vontae Davis is a fantastic corner and Greg Toler has a nose for turnovers--probably the best corner duo the Colts have had since "Big Play" Ray Buchanan and Ashley Ambrose. They've even got depth in Cassius Vaughn, Darius Butler, Josh Gordy and Joe Lefeged. I think Landry is the key to the whole thing--if he can provide run support and adequate coverage in the secondary, this will be a top-tier unit. 8. What about the inside linebackers? I like the unit overall, but Kavell Conner is already hurt, Pat Angerer is a beast muzzled by injuries, and I don't know what we'll get out of Mario Harvey. Jerrell Freeman is the only proven commodity here, and he'll have to prove that last year wasn't a fluke (and I don't think it was). Indy looks a little thin here. Good thing they made that trade for Kelvin Sheppard. 9. Did they let go of the right guys? I thought Drake Nevis did enough in the preseason to warrant a roster spot, but I'm not calling the shots. Likewise, I loved Caesar Rayford. Regardless of what I thought, the Colts jettisoned both of them, cutting Nevis and trading Rayford. Nevis was immediately snapped up, and the Colts finagled a draft pick out of Rayford. His stock was never going to be higher, so I understand the move, but I did want to see what Rayford could do with significant playing time against topflight talent. 10. Will the Colts survive the brutal first half of the schedule? If the Colts want to get back to the playoffs, they'll have to make it through a tough schedule. The Raiders aren't supposed to be very good and neither are the Dolphins. Those are both winnable home games to start the season. After that, though, things get much tougher. They travel to San Francisco to take on the 49ers and then swing out to Florida to play the Jags. Then, it's home against the Seattle Seahawks, another west coast trip to San Diego on Monday Night Football, and home on Sunday night against Peyton Manning and the Broncos, a game I'm already sick of hearing about. After the bye week, the Colts travel to Houston for another Sunday night game on which the entire season could hinge.